In creating Nefertiti, I began contemplating how to create a scent that reflected the composition of Miles Davis, a Saint Louis-area native who got his start filling in on trumpet when Billy Eckstine's band (featuring Art Blakey, Dizzy Gillespie, and Charlie Parker) for a horn player who fell ill when they arrived in Saint Louis. The song of the same name “Nefertiti” is not only one of my favorites ever, but it also became the impetus of the post-bop genre, one of many times Miles Davis changed the landscape of jazz. The recording on the album of the same name is actually the second take, because the tape was not running when the legendary first take was played. What I love is that when you listen to the raw studio take, you can hear Miles exclaim, “No solos!” That is because the traditional roles of each instrument in the arrangement were redefined, with the trumpet and saxophone repeating a dirge-like, hauntingly sweet refrain. As they slowly become disjointed, playing in a round, the rhythm section becomes more and more frenetic, serving as the soloists while the wind instruments provide the glue, as the rhythm section normally would. As I thought about interpreting this concept into a fragrance, I realized the multi-layered way to approach this scent as I was interpreting an interpretation of Queen Nefertiti. 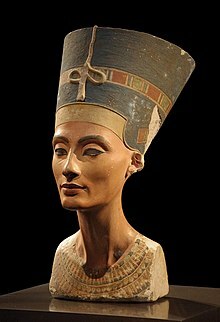 It hit me that beyond her renowned beauty, Nefertiti reversed traditional roles as she defied tradition in her reign just as Miles did in his song. And then as I researched more, I learned that she was known to have worn a perfume composed of honey and orchid leaf. And that is how I began. Of course, over time the concept changed drastically, maybe even more so than others I have composed, because I had a feeling that I wanted to evoke just as much as a particular scent, and so I had to find a way to tap into both worlds. For this Scent Notes, I want to take a look at the accords in this fragrance that are most apropos to the story. First and foremost, a particular type of honey note was essential for three reasons: it was an important component of Nefertiti’s perfume, it is also an important component of kyphi incense (more on that later), and simply how it would evoke the silky, warm trumpet tone of the song’s sweet melody. The biggest component of the honey accord, unsurprisingly, was beeswax absolute. Furthermore, I added some sweet and some floral notes to give it more of the feeling of wild honey. This is also where I would talk about the jasmine accord, even though it was not a component of Queen Nefertiti’s perfume, as I find this sultry white flower is both a great complement to a honey note, with the timbre of a raspy, deliberate trumpet. Finally, the orchid leaf accord is one of three fantasy accords, which means they are idealized versions of this scent. Kind of like poetic license, one of my favorite parts of the olfactory arts is that you often paint things as they should be instead of how they are. There are so many ways to translate a note (although sometimes you do want a photorealistic note). This orchid leaf features the essential oil from the leaf of a Kaffir lime tree, combining the citrus of lime zest with a bright green note, which plays so well in contrast to the jasmine and honey. There is also a slight touch of bourgeonal, a citrus/lily of the valley note, orange blossom absolute and green mandarin essential oil. These elements work together to create a shimmering beauty representative of the song’s melody or even Nefertiti herself. This is another fantasy accord in part because kyphi incense communicates its scent as it burns, also because I wanted to represent the elements that go into the incense…not to mention the fact that they worked so much better with the overall mood I wanted to set if I used them in this manner. Additionally, some of the traditional items are not able to be extracted or unsafe to be used in a fragrance that is meant to be worn on skin or skin-adjacent. At first I worked on a kyphi recipe recorded on a temple wall that dated to the era of Queen Nefertiti’s reign. However, after performing more research, I came across a theory that explained that the recipe fluctuated through eras and regions because some temples used the recorded recipes more as shopping lists and therefore only listed ingredients that could not be sourced locally. In this accord, I included grape and prune notes to represent the wine and the raisins used in the maceration stage of kyphi, frankincense frerena, myrrh, juniper tree (not the berries), sweet birch, green ruh khus (like a rich vetiver), pinyon pine, and cypriol (taken from the cypress tree) and black currant bud absolute. The final fantasy accord is this one, obviously. You can’t smell like weed in public. Well, you can but it might not end well, especially on the job. This is definitely a fantasy accord, although it does use terpenic notes that you might find in the real thing. In fact, my starting point was to look up the terpenic content of strains recommended to enhance creativity according to various Colorado-based businesses. However, these terpenes are also commonly found in many other things, like limonene (citrus, especially lemon), nerolidol (citrus, especially bitter orange), linalool (lavender and bergamot), and alpha pinene (citrus and pine). Additionally, the hemp essential oil is not as sour or dark as the recreational stuff, but rather brighter and more citrusy with a touch of spice to it. I enhanced it with carrot seed oil and leaf alcohol, a watery green note commonly used in green and fougère fragrances. This, along with a silky lavender absolute, creates a smoother, richer note and one that will not make people wonder whether you are baked as a cake. The bombastic hum from the rhythm section in the song Nefertiti crescendos as the song unfolds and the melodic line begins to split open. In the same way, the opening melody of the fragrance dissolves into the base notes in a slow and subtle way, with the honey transforming into immortelle absolute (a flower with strong honey and tobacco notes) and Cambodian oud, a rich and honeyed oud wood oil. The citrus sparkle found in the orchid leaf and in the jazz cigarette accord dissolve into a crisp, light vetiver note, while the resinous notes give way to a light touch of dark-aged patchouli and musks that would be of the time of Nefertiti: castoreum, civet and ambrette seed (all three synthetic replacements in order to both avoid animal cruelty and any skin irritation possibilities). This leads to a dramatic finale. The official note listing is honey, orchid leaf, jasmine, kyphi incense, cannabis, immortelle, oud, vetiver, musk. The extrait will be a permanent addition to the Parfums line, and there will also be a limited-edition, one-time-only run of soap in the Icarus base from Declaration Grooming, as well as our own aftershave and toner. You can experience Nefertiti on Thursday, May 2.